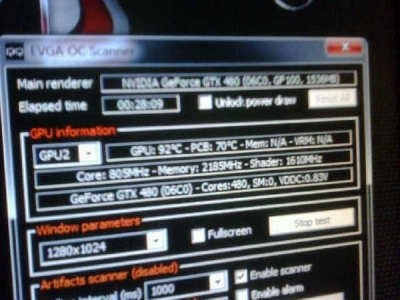 EVGA has taken advantage of the PAX to show its new overclocking tool: EVGA OC Scanner. With EVGA OC Scanner you can detect graphics artifacts even the smallest ones, those that are not visible because they have a particular color that hide them or because they are too small for you eyes! EVGA OC Scanner includes a mini graphics card information center that shows the 3D card features such as clocks (GPU core, memory, shader), temperature (GPU, memory, VRM) or number of streaming processors (the shader cores). The tool includes also an useful function that allows to protect the GPU against too high temperatures: just set a limit for the GPU temperature and when this limit is reached, the rendering is stopped. You can select several screen resolutions, in windowed and fullscreen modes. 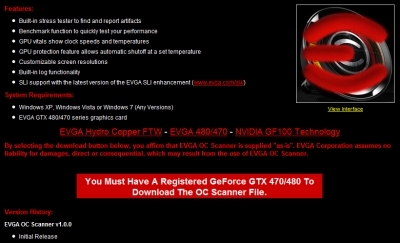 Currently EVGA OC Scanner is limited to registered EVGA GeForce GTX 480 or GTX 470… And from the first feedbacks from this thread, it’s not a wise decision. I feel that EVGA is going to ask me to remove this restriction soon 😉 Wait and see!